Marcus Willem Scholtes is an alumnus of the prestigious Jacobs School of Music at Indiana University, where he graduated with a Doctor of Music degree in Violin Performance in the studio of renowned pedagogue Mimi Zweig. Marcus is currently the Associate Concertmaster of Sinfonia Toronto, a Juno-award winning string orchestra, and his teaching is based at Wilfrid Laurier University in Waterloo, Canada. 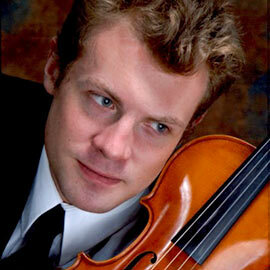 Marcus is a multi-talented artist, excelling on both the violin and piano. He also performs the difficult solo repertoire of both instruments on his own inimitable "The Unaccompanied Marcus" concert series. He performs regularly at many of the recital series' in the area, including the K-W Chamber Music Society, Guelph Connections Concerts, First United Noon-Hour and St. Andrew's Noon-Hour, and of course Wilfrid Laurier University's Noon-Hour series. Marcus performs frequently with the Toronto Symphony Orchestra, the Toronto Concert Orchestra, and K-W Symphony; ongoing chamber ensembles include the Ars Ephemera Quartet based in Hamilton, and the HMM Trio with pianist Heidi Wall and cellist Miriam Stewart-Kroeker. In addition to his rigorous performing schedule, Marcus is a dedicated violin pedagogue and maintains a strong teaching presence in Southern Ontario. He has been the Strings Adjudicator at numerous Kiwanis Festivals throughout the province, has been Professor of String Pedagogy at WLU, and many of his students excel at Royal Conservatory of Music exams. During his years at Indiana University, he was an Associate Instructor of Violin and simultaneously completed an Academic Minor in Music Education. Marcus is a former Concertmaster of the Schleswig-Holstein Musik Festival in Germany which tours Europe, and was highly active with the Britten-Pears Young Artist Programme in Suffolk, England. He was also a participant of the AIMS Festival in Graz, Austria. He holds a Master of Music degree from the University of Michigan, and an Honours Bachelor of Music degree from McGill University, both in violin performance. His doctoral dissertation has been published by Lambert Publishing.